This is one of the best places around both for their quality of meat and their helpful service. Not to mention they have really great sandwiches at lunch. I have been going there for years and they always go out of their way to get the best meat. If they don't have what you want, they will do their best to get it for you. Did I mention that their sandwiches are really good for lunch? Definitely worth a try. You'll be back!!! We needed a caterer quickly for a celebration of life event for our mom. Both Kelli and Steve were very helpful getting the food and staff together. The food was excellent and the staff were wonderful. They got the tables set up and had the appetizers arranged beautifully, then the meal and desserts. They were very attentive to what we needed done and executed that plan flawlessly, with great skill and care. Thank you so much for making a difficult time easier. This is the best meat market in the Santa Barbara area, hands down. The employees and owner make sure they have the highest quality meats. Their chuck/Brisket blended burger meat will give you the most flavorful and juicy burger ever. Marinated fresh 1/2 chickens are great quality and are fabulous on the grill, smoker or drop in the oven. I buy from them at least once a week and couldn't be more pleased. You will pay a small amount more than your traditional super market, but it's 100% worth it! "We used Country Catering for the food for my husbands 60th birthday party. We were very happy with the choice! From the start, Whany and Kelli were very helpful in choosing the menu and following up with me prior to the party. We added appetizers at the last minute with no problem. The food was delivered on time to our house, everything was hot, they provided chafing dishes, and most importantly the food was delicious. Tri tip, bbq chicken, amaaaazing potato salad, best baked beans I have every tasted, the dressing for the green salad was awesome Ranch dressing and the bread was perfect! We ate leftovers for 3 days! They were very professional to work with from beginning to end. I would definitely use them again for any future parties! Great job!" "Steve and the entire staff at country catering know what they are doing! In short, their food is amazing and their service is impeccable. Our guests loved everything about them! In addition to all of this, they are patient, affordable, and willing to work with you to make your event unique. I highly recommend them! Also - get the bacon wrapped scallops for sure!!!" I wish I could give Steve, Kelli, and the entire staff at country catering 10 stars! They catered my daughters wedding 3/19/16 at Santa Barbara Womens Club and it was absolutely fabulous. We started working with Steve months ago planning the wedding. I am in Northern California and my daughter in Southern California, I thought it would be difficult. From choosing the menu, tasting, ordering, last minute changes, Steve made it all so easy. He is honest, professional and delivers food that is absolutely delicious! All of our guests were so impressed with the quality, freshness and service Steve delivered. The wedding was perfect and the food was the best! Thanks Steve, for making the day a complete success! if we could give Steve, Kelli, Kyle, and Country Catering more than 5 stars, we definitely would. I reached out to several catering companies for proposals for our wedding, giving them an idea of what we want. Other companies provided a super fancy and over-the-top proposal that was so busy it was difficult to read. Steve and his team provided me with a menu and proposal of exactly what I had asked for. We were married at Figueroa Mountain Farmhouse and Steve came up to walk through the venue two times before the day. Every single guest at the wedding raved about how delicious the food was from the exquisite cheese & charcuterie platter to the roasted chicken and braised short ribs. They could not believe that such amazing food was being served on top of a mountain! It was exactly what we had wanted and envisioned. The whole team was professional, warm, and friendly. Steve made sure everything was done right and we completely trusted him and his team to deliver the best wedding food! We also worked with them for all of our rentals and linens. Kelli was super KNOWLEDGEABLE about event planning and linens which was super helpful given I wasn't sure what I was doing! They were all very responsive over email and phone. We highly recommend this company. We plan to go to the deli to have Tristrami sandwiches many times as a married couple! 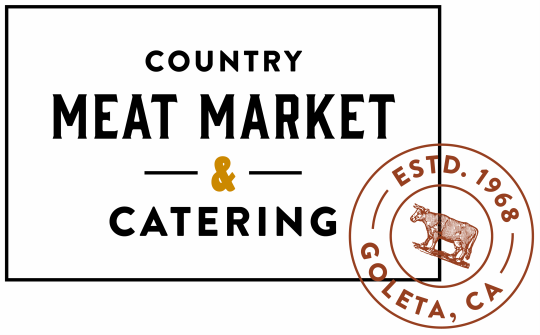 "I just can't explain how happy we are that we picked Country Catering. Steve is truly a wonderful human being to work with. He addressed all of our concerns for a menu that included free range and organic at every possible level, not to mention the way he helped us stay within our budget. I know many brides say this but I was blown away, so many guests have told us it was of the most delicious meals they have ever had at a wedding. He specially aged the Prime Rib so perfectly that it was mouthwatering and because of this we did end up being one of those lucky couples that actually eat at their own wedding (Yay!) Thank you Steve! Also, the wait staff was fantastic and many people commented on how friendly and helpful they were. Even the presentation came out better than I had imagined for a buffet. I honestly would give this review a 6.0 if I could...."
'I would give this place 6 stars if I could. I had them recently for a function at UCSB and I had, hands down, the best hamburger I have ever had in my life. I am not too keen on ground beef, but this tasted like ground heaven! I went back today for lunch and it was even better than I remember it. I also had their pasta salad which was pretty good. I am going to keep coming back because it really is as good as the reviews says. I am even using them for a catered lunch function tomorrow." Country Catering Company is a wonderful little restaurant/meat market right next to Zodo's Bowling Alley in Goleta. Their sandwiches are large and fresh and amazing. I've tried the Cuban sandwich, the Pastrami/Tri-Tip sandwich, the Fried Chicken sandwich, and the Turkey Bacon Avocado. Each sandwich was worthy of a review unto itself, but suffice it to say, these are some of the best sandwiches I've ever had anywhere. The staff is friendly, efficient, knowledgeable, and plainly dedicated to quality food. One of the best sandwich places in the area. My company orders from here a few times a month, and they are always super nice and accommodating. Country Deli definitely ranks at the top of our rotation list. My co-workers are always asking me when we're ordering from them next. Tried a bunch of stuff, but my faves are the Turkey Bacon Avocado Sandwich and Smoked Pork Sandwich. If you're hungry, you can't go wrong with Country Deli. "Steve and his team were so wonderful. Very professional and accommodating of our needs. He made us really comfortable in working with him. The food was delicious. Everything was fresh! Heard nothing but excellent comments from the guests. They all enjoyed everything that was served. Thanks Steve and Country Catering Staff." "OH MY GOODNESS. I CANNOT SAY ENOUGH GOOD THINGS ABOUT STEVE & HIS TEAM (& HIS FOOD!). FROM THE FIRST MINUTE I STARTED PLANNING WITH HIM, I FELT BETTER ABOUT THE WEDDING PLANNING ENDEAVOR - AND I WAS PLANNING PSUEDO LONG-DISTANCE TOO. COUNTRY CATERING HAS GREAT CHOICES FOR FOOD, IS FLEXIBLE, AND DID SMALL THINGS THAT MUST HAVE SEEMED CRAZY BUT WERE REALLY IMPORTANT TO ME (LIKE LEAVE THE FETA ON THE SIDE OF THE SALAD SINCE MY DAD DOESN'T LIKE IT AND MAKE SURE ALL THE FOOD WAS NUT FREE FOR MY COUSIN)! AND THE FOOD AT THE WEDDING WAS AMAZING. (UM... POTATOES SO GOOD THAT IF I HAD TO PICK ONE FOOD TO EAT FOR THE REST OF MY LIFE, IT MIGHT BE THESE POTATOES) DON'T LET THE NAME FOOL YOU - THERE IS NOTHING "COUNTRY" ABOUT THE ELEGANT, CLASSY WAY COUNTRY CATERING CAN ROCK A WEDDING... STEVE KNOWS WHAT IT MEANS TO HAVE THE FOOD MATCH THE VISION AND TEMPO OF THE REST OF THE WEDDING AND REALLY BROUGHT MY DESIRE TO HAVE A WEDDING THAT WAS CLASSY, FUN & RELAXED TO LIFE. HE WAS PROFESSIONAL BUT KIND,FUN AND DOWN-TO-EARTH, INTEGRATED ALL THE RENTALS FOR MY MULTI-SITE OUTDOOR WEDDING, WAS THERE KEEPING STUFF TOGETHER WHEN MY EVENT VENUE PEOPLE WENT CRAZY, GAVE GREAT SUGGESTIONS FOR STAYING ON BUDGET, AND WAS AN AMAZING VALUE WITH HIGH QUALITY, WELL-PRESENTED FOOD. 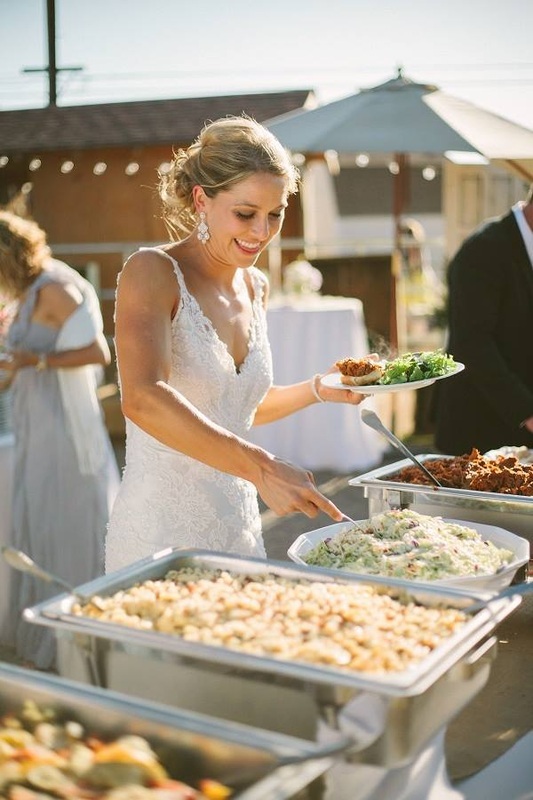 I WAS NERVOUS TO DO A BUFFET, BUT OPTED FOR IT TO MATCH MY OUTDOOR VENUE - HE NOT ONLY PULLED IT OFF BUT I RECEIVED SO MANY COMPLIMENTS FROM GUESTS ON THE WEDDING THAT REFLECTED THE COMPANY'S QUALITY OF FOOD AND SERVICE. AND SERIOUSLY - VALUE FOR THE COST - SO MUCH MORE REASONABLE THAN MOST OF THE SANTA BARBARA CATERERS I LOOKED INTO. AND STEVE IS A GENUINELY NICE PERSON - EVERY TIME I VISITED THE SHOP (WHICH PS HAS GREAT TRI-TIP SANDWICHES) HE AND EVERYONE THERE WAS SO NICE AND RELAXED. HE MADE ME FEEL LIKE A NORMAL PERSON PLANNING AN AWESOME PARTY ON THE MOST SPECIAL DAY OF MY LIFE (INSTEAD OF BEING A CRAZY BRIDE WHO DIDN'T HAVE A CLUE HOW TO PLAN A WEDDING!) 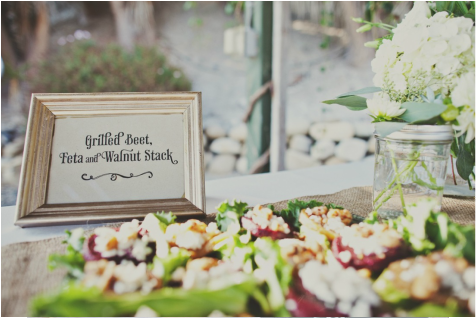 A++ VENDOR - MADE SURE MY WEDDING WAS AMAZING & I WAS HAPPY & FED!" 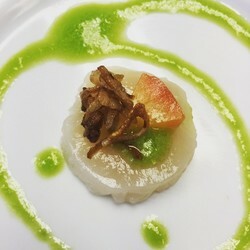 "We received tons of compliments from our guests regarding the food at our wedding. We selected grilled tri-tip and salmon as our main course. Both were grilled to perfection, along with the delicious sides. The fresh hors d'oeuvres made cocktail hour a hit as well. We did overestimate on our headcount - as probably happens at most weddings, so make sure to account for that - but there was more than enough food even with many guests getting seconds. Steve was extremely knowledgeable on the requirements/setup of our venue at Elings Park, and prepared a detailed proposal that included rentals from Discount Party. This dual service through one vendor was SO helpful for a very busy bride & groom. Compared to the bids we received from other caterers, the value is definitely there for the price. Last but not least, the whole team that works with Steve was very pleasant and friendly. They stayed on top of all the details and provided top-notch catering services until the very end. Thank you Country Catering Company! Highly recommended."